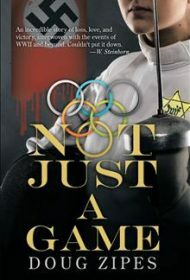 Doug Zipes’ Not Just a Game is an intriguing alternative history novel that immerses readers in a deadly conspiracy ensnarling three generations of Olympians. Starting with Adolf Hitler’s fizzled showcase of Aryan superiority in the1936 Berlin games, the story continues through the deadly attack on Israeli athletes in 1972’s Munich games and twists and turns toward a taut climax at the 2016 Rio Olympics. Anti-Semitism is the thread tying it all together as Zipes takes readers back to the 1936 Berlin Olympics when Dietrich Becker, secretly a Jew, loses to the legendary American track star Jesse Owens and faces Hitler’s wrath. Thirty-six years later, Becker’s son, Adam, a coach for the Israeli team, witnesses the massacre of Jewish athletes at the 1972 Munich games. Adam’s daughter, Kirsten, arrives at the 2016 Rio games, intent on fighting for the gold and, unexpectedly, also to save her life from Nazism reborn. Zipes revisits and expands persistent conspiracy theories that Hitler’s and Eva Braun’s suicides at WWII’s end were faked and that the couple escaped by submarine to Argentina. There, they lived out their lives peacefully, but the dream of a Fourth Reich didn’t die with them; its mantle was taken up by descendants, sympathizers and assorted fanatics who planned to use the Rio Olympics to resurrect their treacherous dream. Zipes’ narrative is engrossing, the writing clear and spare enough to avoid interfering with the brisk plot. Zipes’ careful research is reflected throughout, especially in his detailed yet accessible narration of Olympic fencing techniques. Because of the plot’s complexities, readers are advised to pay close attention to the characters in early chapters as the author jumps around in time, which can be disorienting. Some may also find that the stage-setting chapters unfold a little slowly. But patience is well rewarded as the story heats up and powers to a stunning conclusion. Fans of alternative history and thrillers will find Not Just a Game an immensely satisfying read.